At the age of 18, Sheriff Maciol joined the New York Mills Volunteer Fire Department and today is an active lifetime member. At the age of 20, Sheriff Maciol was appointed as a patrolman to the New York Mills Police Department. Three years later, he transferred to the Whitesboro Police Department, where he served as a police officer for 21 years, prior to taking office as Oneida County Sheriff on January 1, 2011. During his police career, Sheriff Maciol was trained and certified in numerous areas of law enforcement. He also served as a D.A.R.E. Officer for six years within the Whitesboro Central School District. To this day, Sheriff Maciol is honored to have received several awards throughout his police career. Since 2011, Sheriff Maciol has implemented many cost saving and efficient practices. Sheriff Maciol saved over 3 million dollars in tax payers’ money in his first year in office. The Sheriff has attended training and conferences throughout New York State through the New York State Sheriff’s Association and nationally through the Center for Missing and Exploited Children. Sheriff Maciol is a 2014 graduate of the 106th session of the National Sheriff’s Institute “Executive Level Management Training” held in Aurora, Colorado. Sheriff Maciol returned the Sheriff’s Office as members of the Oneida County Drug Task Force, the NYS Operation IMPACT program, participated in the GIVE (Gun Involved Violence Elimination) Initiative, and helped create the Oneida County Burglary Task Force. The Sheriff is also currently serving 7 schools within the county with School Resource Officers. Sheriff Maciol has always focused his law enforcement attention and resources on the victims of violence and crimes. Whether it be victims of domestic violence, sexual abuse, physical abuse, elder abuse, or animal abuse, their needs have always come first. Sheriff Maciol was, and continues to be, an active community member. He made local history by becoming the youngest Mayor of the Village of New York Mills, proudly serving his community in this position from 2000 to December 31, 2010. Sheriff Maciol also served a two-year term on the New York Mills School Board of Education. Sheriff Maciol is also a member of the Oneida County Law Enforcement Coalition, YWCA Domestic Violence Coalition, the Oneida County Magistrates Association, the NYS Sheriff’s Association serving on its board as Secretary, the National Sheriff’s Association, the Central NY Chiefs of Police Association, the National Association of Chiefs of Police, the NAACP, the NY Farm Bureau, Sons of the American Legion Post 1376, Polish League of American Veterans (honorary), Firemen’s Association of the State of New York, as well as the New York Mills and Oneida County Historical Societies. 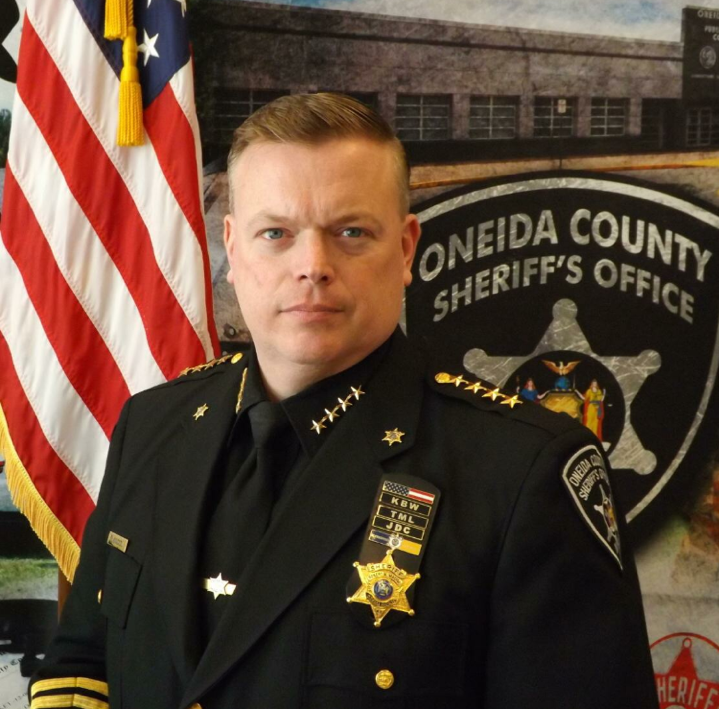 Sheriff Maciol is a lifelong Oneida County resident, having been born, raised and educated in New York Mills, New York, where he currently resides with his family.